This may sound hypocritical, considering I pay for a CrossFit membership and have/am hosting a nutrition class, but being healthy is free. There are millions of free resources and information online, like my blog, aimed at helping people make healthy choices. You are what decides the price tag on healthy. I know I will hear the argument that healthy food costs more, but I beg to differ. That $3 bag of chips you are eating every night with supper can easily be replaced with Margaret Holme’s Seasoned Green Beans. (Get the seasoned, not the plain & don’t ruin them by rinsing them.) No where in the rule book of healthy, does it say that everything you eat must be organic, made from scratch, with love and patience. Sometimes healthy is just making one smart substitution, until it becomes a habit. Being healthy is not a fad diet that is unrealistic and not sustainable, it’s not a magical wrap that makes you lose 5 inches in 2 weeks, or that new pill that helps you lose all water weight just to gain it all back and then some. Healthy is consistently making smart food choices, keeping a check on your mental wellness, and staying active. To really be healthy, you need to consistently make good food choices. “Good” food choices vary from person to person, but I feel like deep down, everyone knows that MoutainDew isn’t good for you. Deep down you know getting steamed vegetables is a better side option than fries…you know, you just ignore it. You know that the loaf of bread and butter you ate waiting on your meal, just canceled out the salad & light dressing you ordered. If you are consistently canceling out the healthy food choices you make, by having one or two unhealthy options with it, you will just keep spinning your wheels and give up. Eating healthy isn’t a punishment. I’d much rather have roasted chickpeas than Doritos. High school Jackie, would have chosen Cool Ranch Doritos all day long. I didn’t grow up eating roasted chickpeas, but that is what I would pick now. You create new habits slowly & that becomes your life style. Simple as that. This week I need easy meals. Nothing new and complicated. I’m going back to work on Monday, after a much needed Christmas break and Scarlett’s birthday is Friday! With so much going on this week I don’t need our weekly meals stressing me out. I try to make our kids’ parties special, so I’ll need all my extra time to make that happen this week and not be stuck in the kitchen cooking. I absolutely love this meal. I love any meal that is tasty and can be combined into one dish. It doesn’t make tracking easy, but it makes cooking and clean up easy for me. The only major change I make is the chicken. I love legs and thighs, but they have more fat than I need (because I would rather use my calories on protein and carbs), so I am going to use chicken breasts. It is finally starting to feel a little bit like winter again. I hope it starts to feel a lot like winter soon, because Scarlett’s birthday is a winter ONEderland theme. Go figure it would be 80 degrees in January when I plan a winter wonderland. Oh well! In hopes that it does continue to feel like winter, I will be making chili. I don’t use turkey in my chili, but it is a healthy alternative. Where we get our deer meat processed doesn’t add a lot of extra fat so the venison stays super lean I don’t like to add any extras like shredded cheese or sour cream, that kind of defeats the purpose of healthy chili. I like that this meal is loaded with tomatoes and bell pepper. It is almost like a vegetable soup with meat. This salad never ceases to impress me. It is simple, a one plate meat, and requires very little effort. I skip the oil in the salad dressing and use non-fat feta so, there is little to no fat in this meal. I always pick between avocado or almonds, I don’t use both, because they both have a lot of fat in them. If you are on the fat for weightloss journey have at it, I just prefer most of my calories come from protein and carbs. Pork chops are probably the fastest meat to cook for me. I can throw them in the oven the night of or cook them ahead of time. Pork chops don’t seem to dry out as easily as chicken breast and are easy on the wallet too. Extra bonus, they have more protein per gram than chicken. I cook my pork chops on 425 in the oven, spray both sides with olive oil, and season with Tony Chachere’s. It only takes around 10 minutes, depending on the thickness of your meat. This simple kale salad, really is what it says it is, simple. The first time I made this salad I thought there was no way it would be as tasty as it is. The dressing is really what does it. I skip the oil in the dressing, but definitely don’t omit the fresh garlic. The garlic is what makes this salad so great. As stated above, I am going to be prepping for Scarlett’s party this week! In order to make things easier on me and not go the takeout route, I am cooking simple meals and repeating meats. Like I said before, I cook my pork chops on 425 in the oven, spray both sides with olive oil, and season with Tony Chachere’s. It only takes around 10 minutes, depending on the thickness of your meat. The great thing about roasting vegetables is you can literally use what you have on hand, in your garden if you’re lucky enough to have one, or whatever vegetables are in season at your grocery store. This time I chose cauliflower, bell peppers, and carrots. I love using turmeric, salt, and pepper on my vegetables. If you want to make it extra special, you can make a tahini-lemon dressing to go with it. 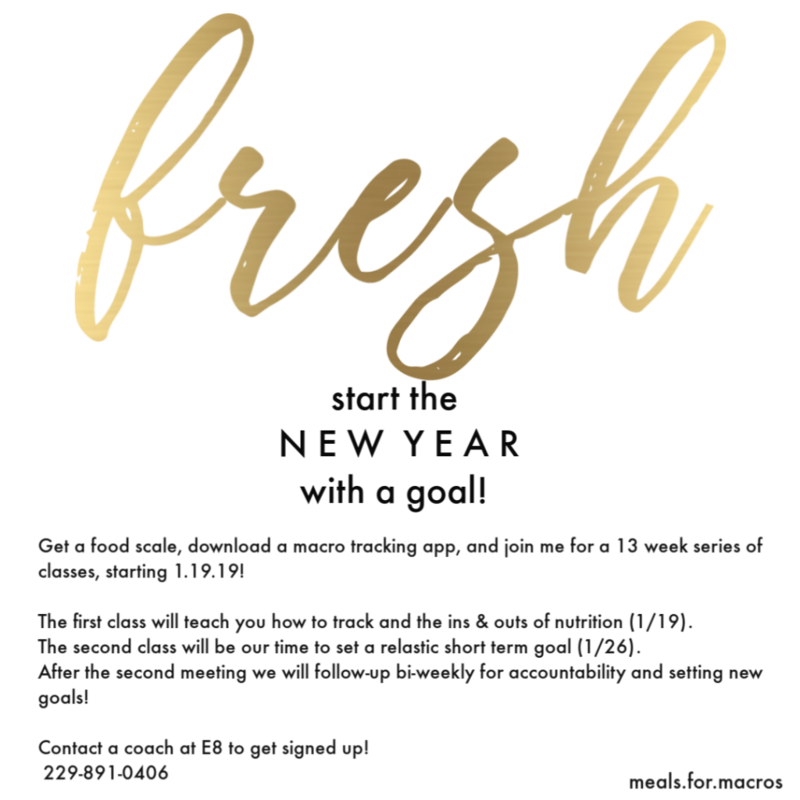 Don’t forget to sign up for my nutrition class starting January 19th! The first two meetings are $35/each and each bi-weekly meeting is $25. Your menu looks like a very good start to the new year. Thanks for including me! Thank you so much, the recipe was awesome!